In our daily lives, we can all choose to do things that help species at risk recover, and that help prevent other species from becoming at risk. There are many ways that NWT residents can act as stewards of the land, animals and plants. Some of the things that people can do cost money, and there are sources of funding available (click here for more information). The NWT General Status Ranking Program is a collaborative program that collects information on species of the Northwest Territories and does a preliminary evaluation of the biological status of each species in the NWT. 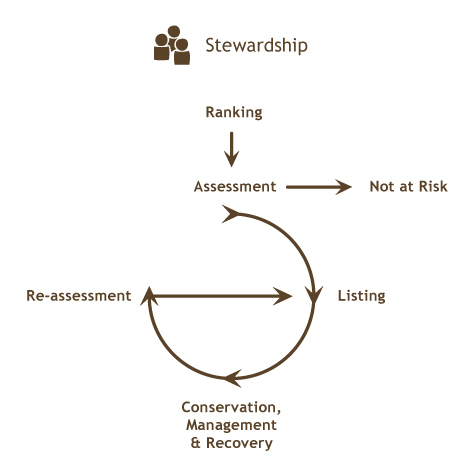 Species ranked May be at Risk are the highest priority for more detailed assessment. To find out if a species is in danger of disappearing, a detailed assessment of its biological status is done. The assessment is done by a committee of experts using an independent, transparent process. Using the best available Aboriginal traditional knowledge, community knowledge and scientific knowledge, each species is assigned to a status category that tells us about its level of risk. Categories of species at risk are: Extinct, Extirpated, Endangered, Threatened, and Special Concern (click here to find out what these categories mean). Status in the NWT is determined by the NWT Species at Risk Committee. Status in Canada is determined by the Committee on the Status of Endangered Wildlife in Canada (COSEWIC). Based on their assessments, these advisory groups make recommendations on the legal listing of species at risk. The territorial Species at Risk (NWT) Act and the federal Species at Risk Act (SARA) both apply in the NWT. Each has a legal list of species at risk: the NWT List of Species at Risk (territorial) and SARA Schedule 1 (federal). Decisions on whether to add a species to the list are made after consultation and take socio-economic factors into account. For the NWT List of Species at Risk, the decisions are made by the Conference of Management Authorities. For SARA Schedule 1, the decisions are made by the federal government. Once a species is legally listed, the responsible bodies must set goals for the management or recovery of that species, and identify actions to be taken to meet these goals. There are also regulations that can be put in place to protect the species or its habitat. Under the Species at Risk (NWT) Act these regulations are developed on a species by species basis anytime after assessment, following the appropriate consultation (click here for more information). Under the federal Species at Risk Act some protective regulations come into force automatically as soon as the species is listed (click here for more information). The status of species can change over time. Species at risk are usually re-assessed every 10 years, if not sooner, to see if their status has changed. The re-assessment can also lead to a change in listing. Under the Species at Risk (NWT) Act, a listing lasts for 10 years.